OutDoors - walking to success? 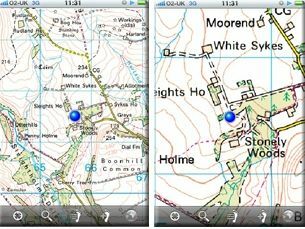 A British inventor is hoping to ensure that walkers can never get lost again, with the OutDoors App for iPhone service using the famed Ordnance Survey maps of the UK to ensure that even the mountain tops are easily navigated. The service by RoadTour, which uses the GPS chip in later model iPhones, has the OS maps stored locally on the device, although you will have to pay just under £25 for each region that you want. As the press release says: "The software locates the user within the map, enabling him/her to make sense of their surroundings.
" Importantly, it is not reliant on a mobile phone signal and instead makes use of the free satellite navigation technology built in to iPhones to register the user's location on the detailed maps that are stored on the device. "This means that walkers have a reliable and highly detailed guide, even in Britain's most remote locations." If you're a technophile hiker, the OutDoors app sounds like a must-have purchase, although at £24.99 represents a sizeable outlay, with those who want multiple regions having to fork out serious cash. It should be pointed out, however, that buying the OS maps for each of the large regions included would cost significantly more than buying the App version; RoadTour puts the cost for paper maps of the region at around £120. There is a 'Lite' version offering the UK road networks, but it is the power of the immensely detailed OS maps that will be the true draw. Mark Salter, from Ordnance Survey said: "Britain's countryside is incredibly diverse and offers many possibilities with much variety. "With so many people taking the opportunity to enjoy life outdoors, we're delighted that RoadTour is bringing our highly detailed maps to the iPhone. "This innovation should encourage a whole new group of people, particularly the young, to experience the countryside with confidence, armed with accurate and dependable Ordnance Survey maps". Inventor Daniel Taylor of RoadTour who developed the product added: "OS maps are the most detailed and accurate in the world and they are stunning creations. "The beauty of our product is that it extends the experience and places the user within the map so that he or she can follow a route with confidence. "Suddenly the word 'lost' simply no longer applies and even total beginners can explore much more of Britain's countryside in safety." The OutDoors service should be coming to other platforms soon, and is available now from iTunes.